Believe it or not, one if the theories proposed to explain the UFO phenomenon is that they are as yet undiscovered biological entities. That’s right. Critters in the sky! 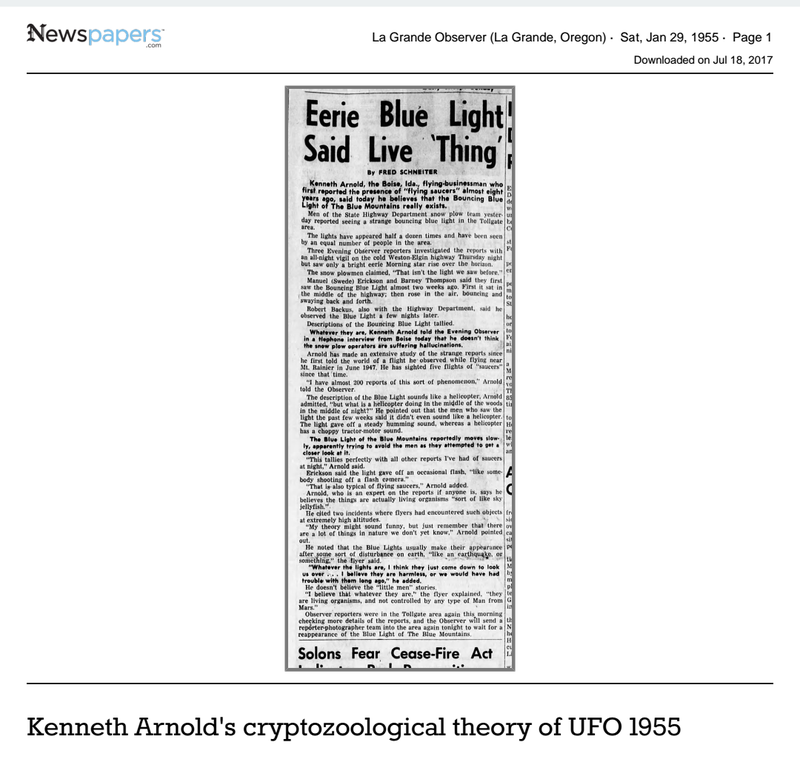 What’s more, the earliest well-known proponent of the Cryptozoological Theory of UFO, as it’s called, was none other than Kenneth Arnold, the fellow whose June 24, 1947 sighting of nine unusual aerial objects near Mt. Ranier, Washington, marked the official birth of the UFO phenomenon. Half a decade later, he’d changed his mind. My father’s experience was of a spiritual nature, and he was personally a believer in a divine plan for each person’s life. He believed in a Creator, but believed that the universe and our surroundings were unlimited in thought and creativity. 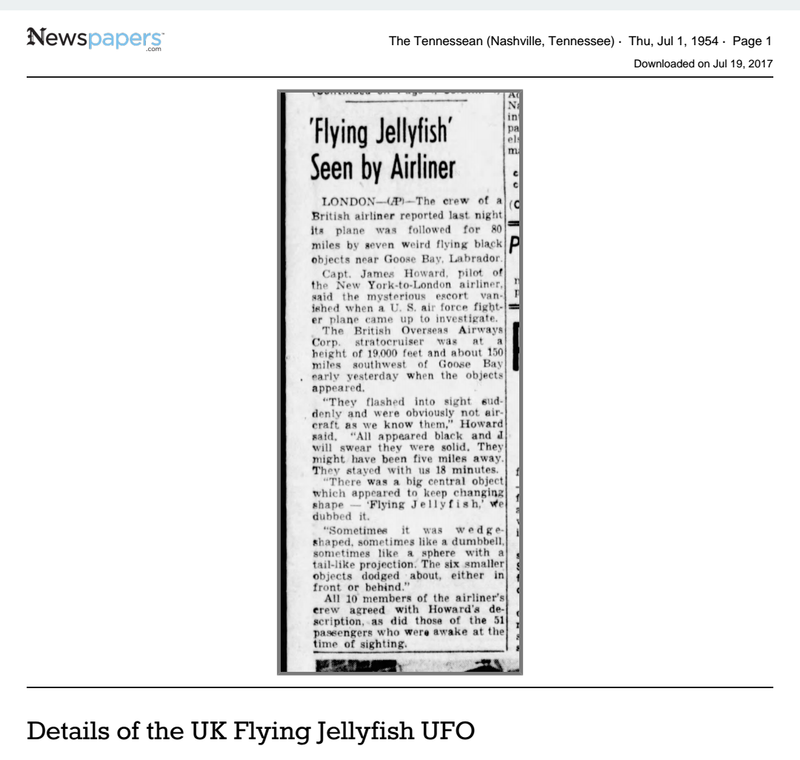 What interesting is that “sky jellyfish” had been reported in 1954. 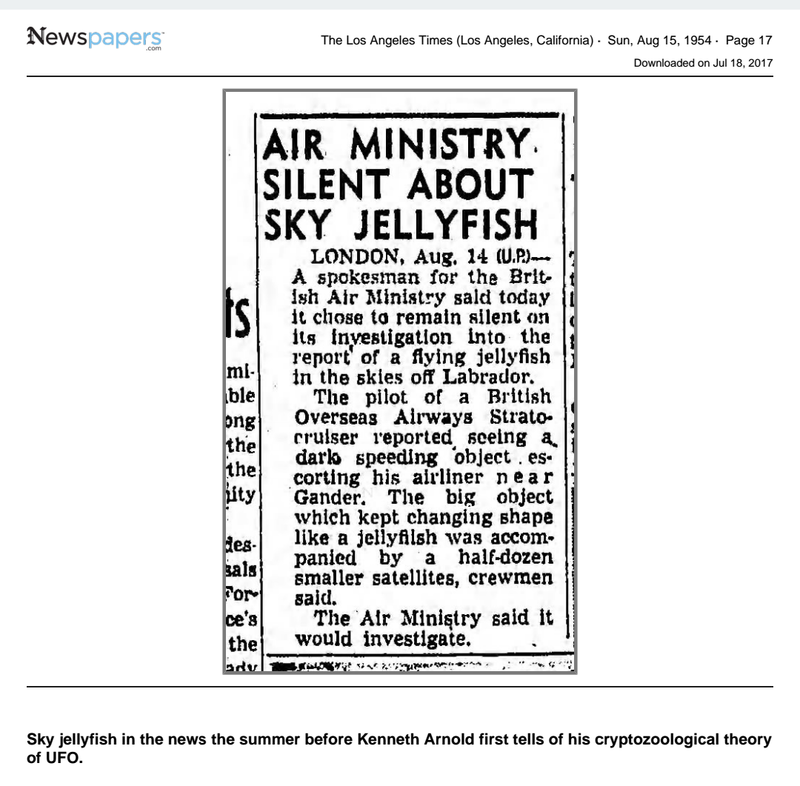 For example, the LA Times carried an article called “Air Ministry Silent About Sky Jellyfish” regarding a sighting by a London correspondent. 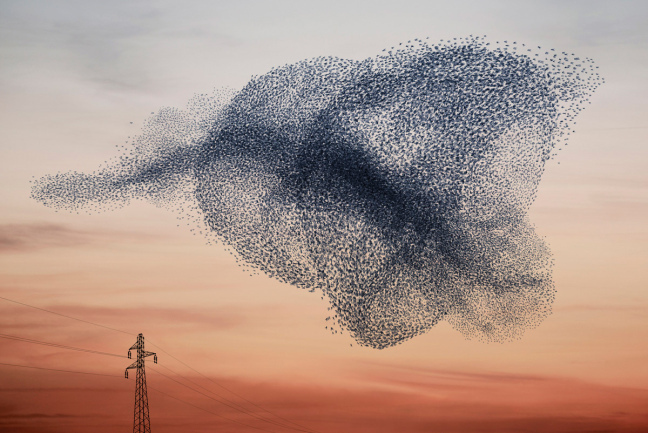 The most likely explanation for the Sky Jellyfish of the story cited, especially given the fact that it “kept changing shape like a jellyfish” and was “accompanied by a half-dozen smaller satellites,” is that it was nothing more than a murmuration of birds (i.e., a bird swarm). 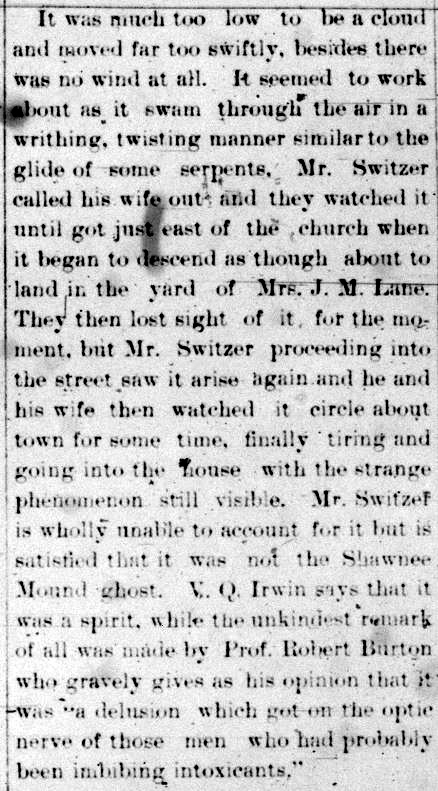 This was also the most likely explanation for the so-called Crawfordsville Monster of 1891. 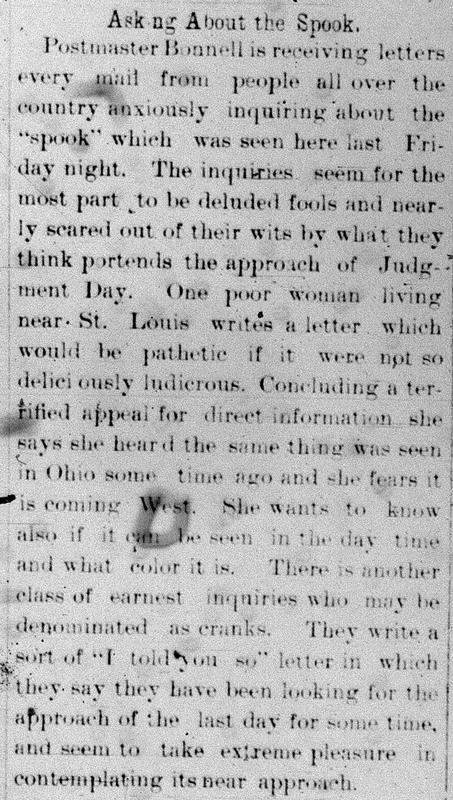 Of course, there were certsinly other possible explanations if we take into account the fact that the town was already infamous for sending cats up in balloons! 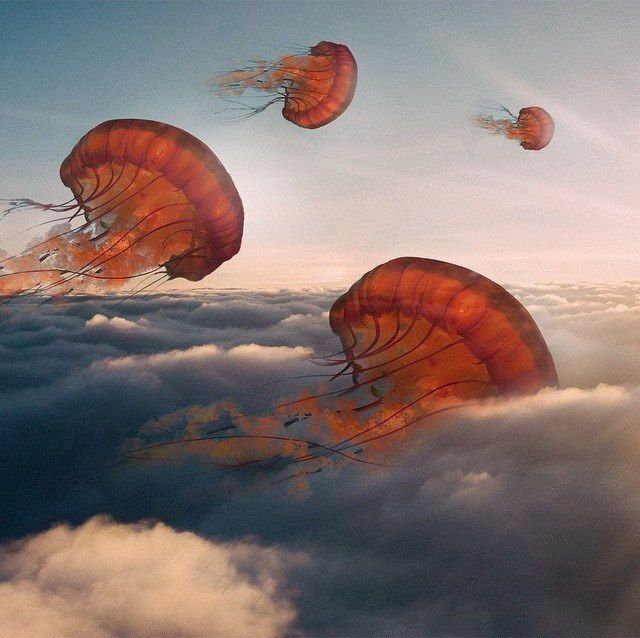 Unknown, luminous things, or beings, have often been seen, sometimes close to this earth, and sometimes high in the sky. It may be that some of them were living things that occasionally come from somewhere else in our existence, but that others were lights on the vessels of explorers, or voyagers, from somewhere else. 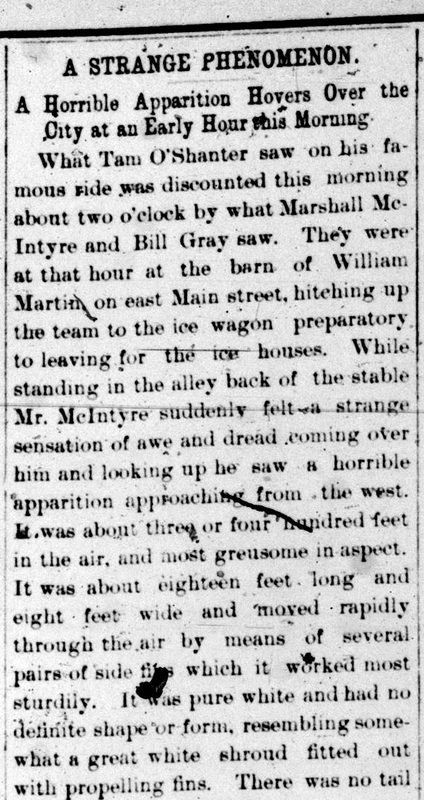 Certainly, Fort mentions the Crawfordsville Monster in Chapter 12. 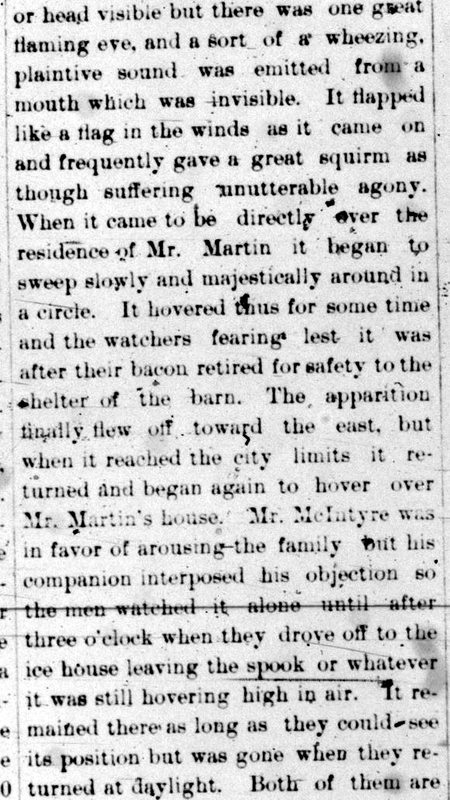 In any case, the idea itself predates Fort. In November 1913, Sir Arthur Conan Doyle’s short story, “The Horror of the Heights,” was published in the Strand Magazine. It is then revealed that the aviator has gone missing though his plane was found crashed on the border of Kent and Suzzex. 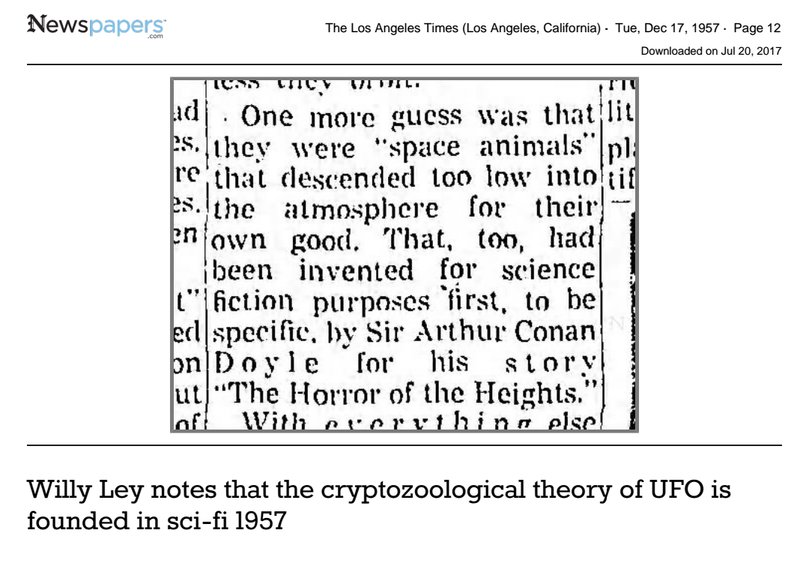 And lest you think that was a stretch, historian of science Willy Ley wrote in second part of his four part “Things in the Sky” series in the December 17, 1957 edition of the Los Angeles Times that he believed the cryptozoological theory of UFO was founded upon Doyle’s science fiction story. The question is: Did Arnold develop his idea of cryptozoological UFOs with this story in mind? It is difficult to determine where Kenneth Arnold got his views: from fiction or Forteana, the murmurations of birds or his own imagination. What we do know is that in 1967, Mr. Arnold stated that he came up with his theory after his second UFO sighting (not the more famous Mt. Ranier sighting). This at first seems unlikely. 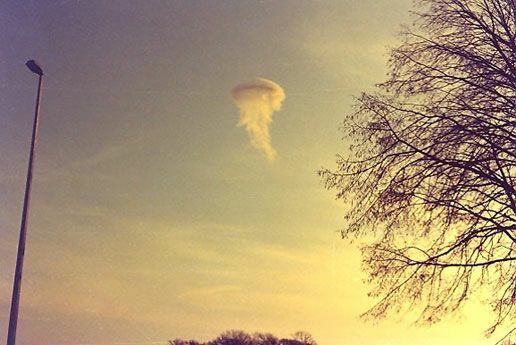 His second UFO sighting was on July 29, 1947, enroute to the now-infamous Maury Island UFO affair, and his views immediately afterward are well-documented. The possible existence of some sort of strange extraterrestrial animals has been remotely considered, as many of the objects described acted more like animals than anything else. 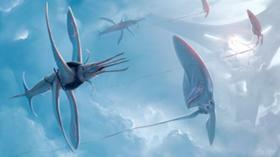 However, there are few reliable reports on extraterrestrial animals. “I recall looking at my instrument clock which read about five minutes of seven. As I looked up from my instrument panel and straight ahead over the La Grande valley, I saw a cluster of about twenty to twenty-five brass-colored objects that looked like ducks. They were coming at me head on and at what seemed a terrific rate of speed. I grabbed my camera and started rolling out film. Even though I thought they were ducks when I first saw them, I wasn’t taking any chances. The sun was at my back and to my right. These objects were coming into the sun. I wasn’t sighting through the viewfinder on my camera but was sighting along the side of it. As this group of objects came within 400 yards of me they veered sharply away from me and to their right, gaining altitude as they did so and fluttering and flashing a dull amber color. I was a little bit shocked and excited when I realized they had the same flight characteristics of the large objects that I had observed on June 24. These appeared to be round, rather rough on top, and to have a dark or a light spot on top of each one. I couldn’t be absolutely positive of this because it all happened so suddenly. I attempted to make a turn and follow them but they disappeared to the east at a speed far in excess of my airplane. I knew they were not ducks because ducks don’t fly that fast. After a few minutes I gave up the chase and continued to let down at La Grande. I phoned Dave Johnson from there and related my experience but told him not to print it. I knew he had more than a newsworthy interest now in flying disks. I questioned the whole crew of the Empire Airlines ship to see if they had seen this cluster of objects, too. If they had seen them, they would not admit it, but there is a good possibility they did not see them. They were on almost their final approach to the La Grande airfield, their plane being much faster than mine, and this cluster of objects at the time would have been seven to nine hundred feet above them. 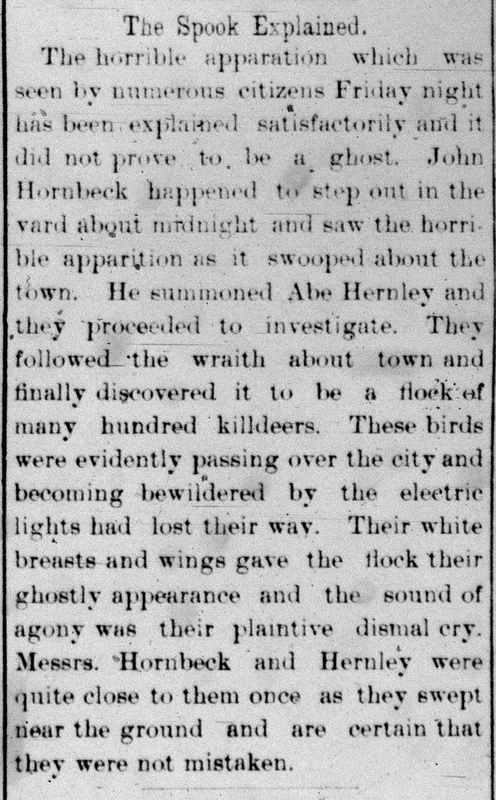 I heard later that several farmers in the vicinity of Union had observed what they thought a peculiar cluster of birds that same morning. I did not know of this until much later. Actually, they flew in a cluster more like blackbirds than ducks but each one was larger than a duck. I should judge some twenty-four to thirty inches in diameter. They rather wheeled on edge, flipping as they went as efficiently as when they were flat in reference to the surface of the ground. That morning I was pretty disappointed that no one around the airfield had seen them, to my knowledge. To me, it seems obvious that he saw a bird swarm. Whatever he saw, he appears to have stuck with the ET Hypothesis for from 1947 to 1952 at least. It is evident then that something made him reconsider, and that something about this sighting convinced him to change his theory. 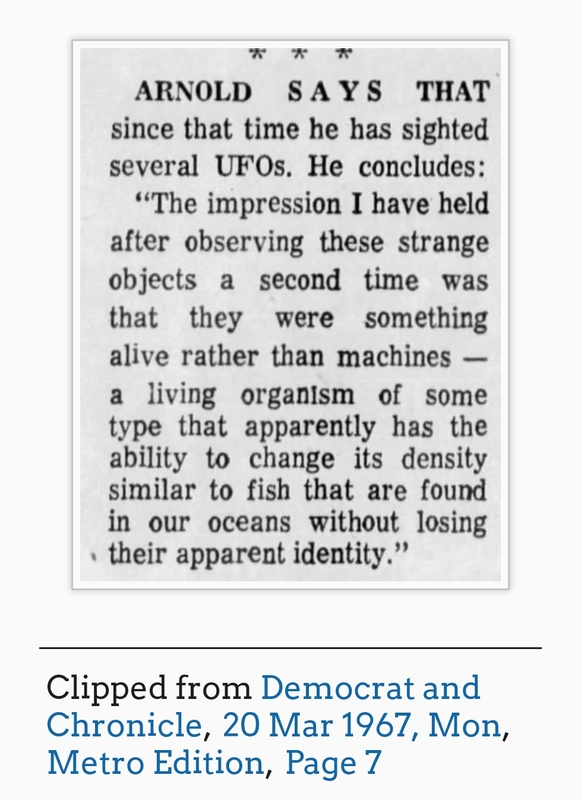 If we look at the events between 1952 and 1955 when he first publicly endorsed the cryptozoological theory of UFO, we find only one possible catalyst. 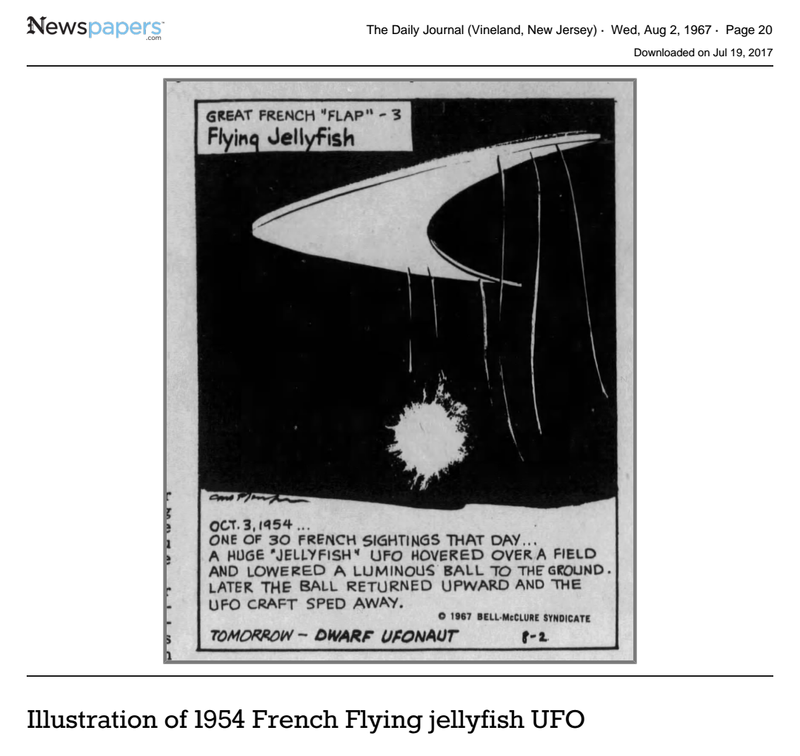 The much-repeated news stories of flying jellyfish UFOs throughout July 1954. 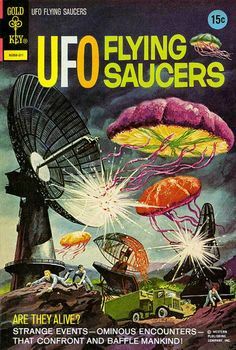 If he considered his second sighting in light of the details that seemed to suggest animal behavior or details, it makes sense that, in light of the July 1954 wave of Flying Jellyfish UFOs, he could come to the conclusion that flying saucers were living organisms. 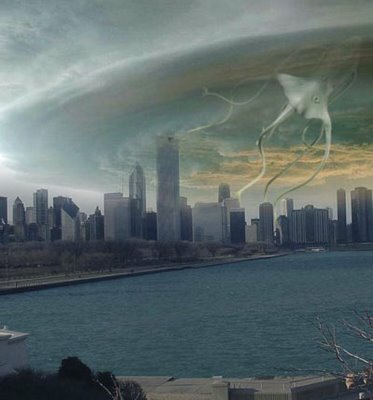 The Cryptozoological Theory of UFO has endured as a minority view within the field as a possible explanation for some UFOs. They were featured in a 1968 Gold Key Comics issue. 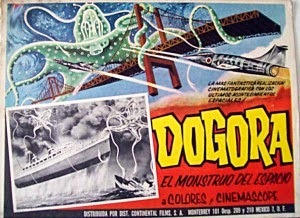 They’ve even been featured in a Japanese kaiju film as the title creature Dogora (1964). This particular photograph had been explained as being a “dampsky”, or a puff of smoke, in essence, produced by one of the exhaust shafts of a nearby factory. 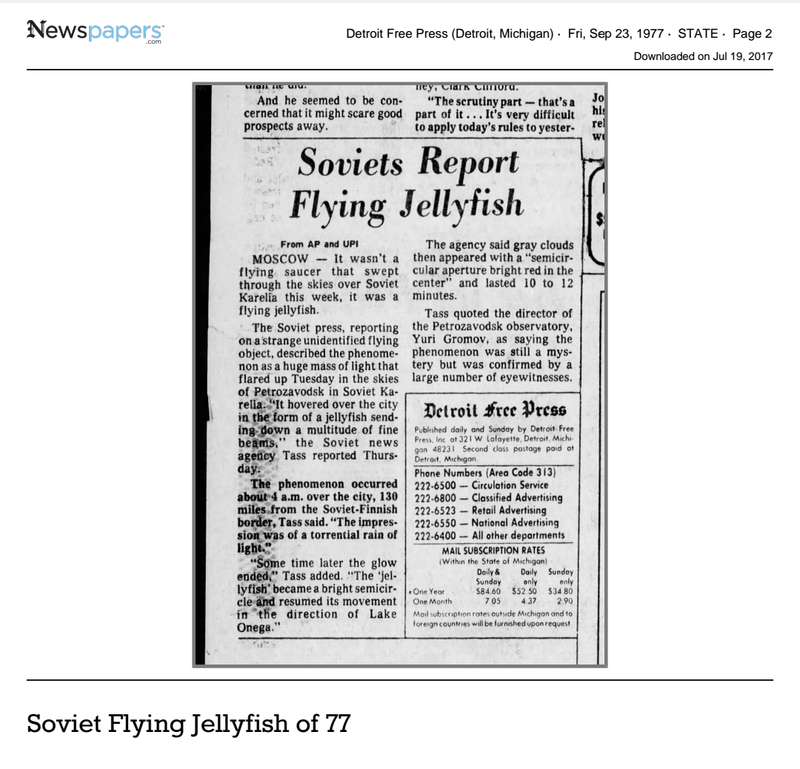 Likewise, there was a report of a Soviet flying jellyfish in 1977. 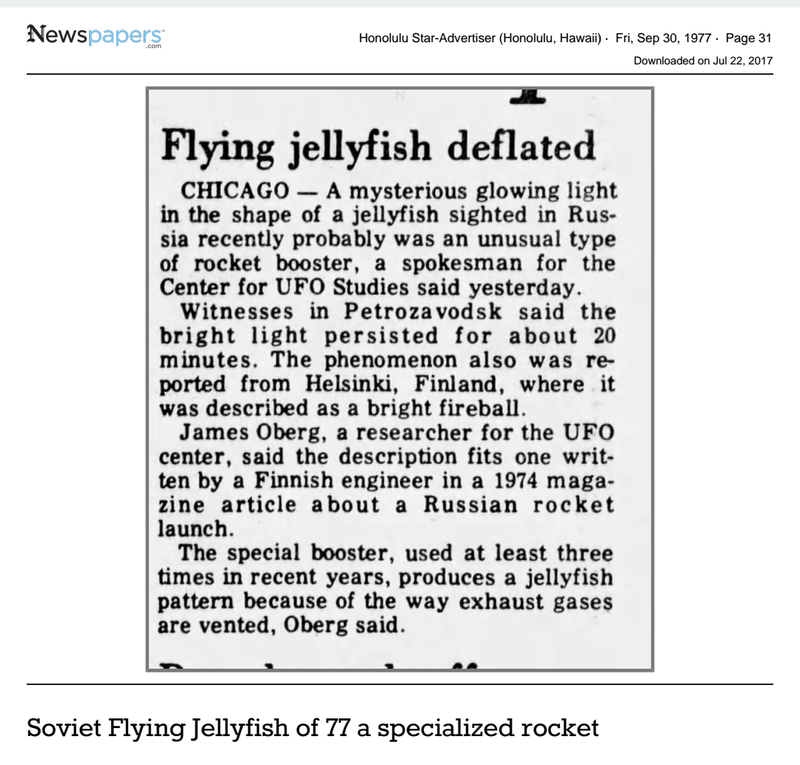 That sighting was later explained as being the result of s specialized type of rocket. 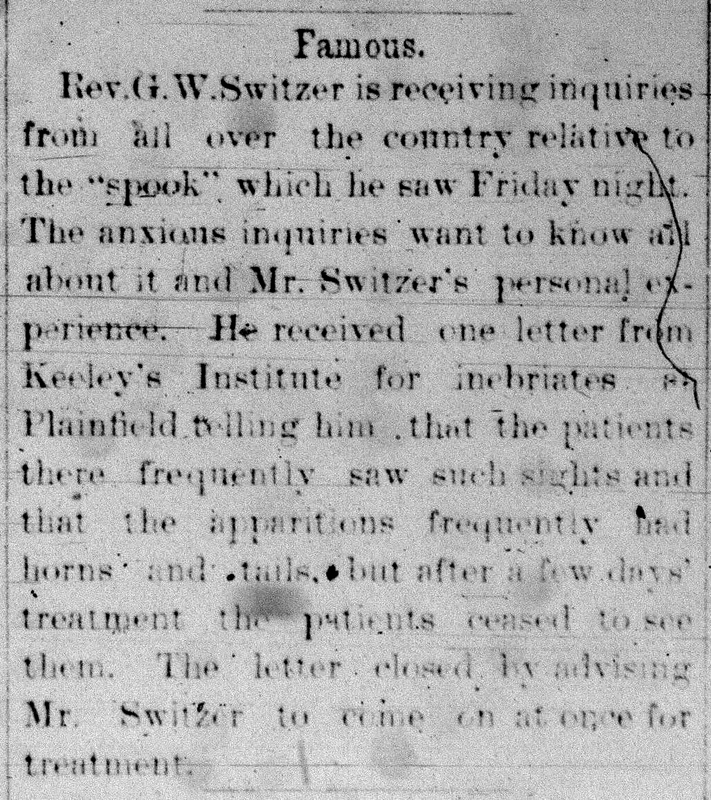 I personally don’t think that there are unknown biological aerial entities behind the UFO phenomenon, but if the history of cryptozoology teaches us anything, it’s that we could be wrong. Great article. However, your conclusion may be premature. There is a wealth of evidence supporting the hypothesis for the atmosphere as a habitat. See YouTube channel The Living Sky or website thelivingsky for more info. We’ve just begun exploring the sky and I predict we will find a wide range of life…once we start actively looking.